The aim of the Praxis website, its publications, and the online study course is make the Christian Inner Tradition accessible to a modern audience so that participants come to experience the living truth it conveys. This online video conference series is based on writings by Robin Amis on the Christian Inner Tradition: the mystical, psychological teachings of the early Church Fathers. We learn of the teachings through study and dialog but come to understand their meaning by our efforts to apply them. The material draws upon Boris Mouravieff’s Gnosis series as well as writings from the early church fathers and other sources in the Tradition. These weekly, web-based meetings combine study, experience-based discussion, and prayer (both verbal and silent) to help build a perceptible stillness within the participants. Please contact us at info@praxisresearch.net if you would like to join the sessions. We are meeting every Saturday at 10:00 am EST. Holy Hesychia. Updated translation of The Triads: Book I by Saint Gregory Palamas, with commentaries by Robin Amis. Writings from the Philokalia on Prayer of the Heart. 3-CD audio recording of selected passages. The Eros of Repentance (new edition). Revised and updated by monks on Mt. Athos. Projects now in process for publication in the near future include Writings on Esoteric Christianity by Boris Mouravieff and a comprehensive index to Mouravieff’s Gnosis, Volumes I, II, and III. If you have questions on our publishing efforts or wish to engage with our work please email us at info@praxisresearch.net. Also, please consider a tax-deductible donation to Praxis Research Institute to help sustain our research, publications, and outreach activities. Donations can be given through this website under the http//www.praxisresearch.net/MAKE­_A_DONATION/ tab. Thank you in advance for your support. Background on Praxis: its mission, principles, and practices. Praxis Research Institute was established in Massachusetts in 1992 as a registered not-for-profit research and educational organization. Its mission is to study and pass on the inner, spiritual teachings of Christianity. 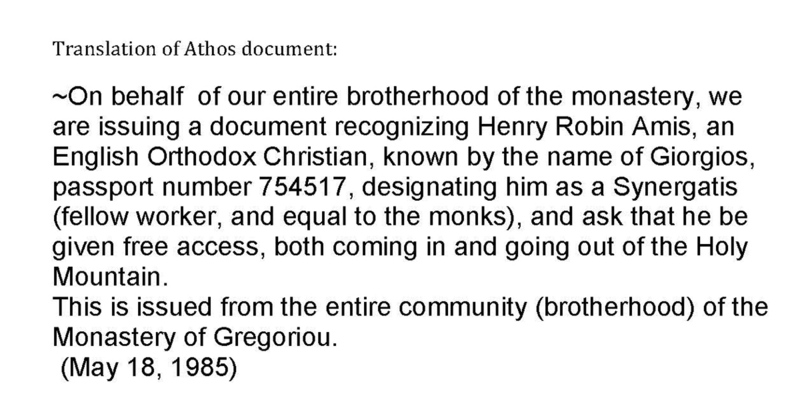 Though largely unknown in the West, this tradition dates back to the Gospels and the writings of the early Church Fathers, and is still in practice in monastic communities, in particular Mount Athos in Greece, where Robin Amis was a regular visitor. During one of his initial pilgrimages to the Holy Mountain, he was given the charge by renowned elder, Father Paisios, recently canonized as Saint Paisios, to convey the ‘truth of the heart’ to the English-speaking world. This ‘truth’ is described in Mr. Amis’ books, A Different Christianity and Views from Mount Athos, as well as in other works published by Praxis and its affiliate, Pleroma Publishing Ltd. These include the Gnosis series by Boris Mouravieff, works on prayer and stillness (hesychia) by Sts. Theophan the Recluse and Gregory Palamas, and writings on the 4th Way by P.D. Ouspensky. Praxis affirms that every human being comes into the world with both a psychological-physical nature and a spiritual nature. The former consists of physical, emotional, and intellectual capacities which can be developed through formal education and ordinary activities in the world. The latter consists of higher faculties that, once purified, make it possible to connect human and divine. In Greek, these faculties are nous, the power of attention, discrimination, and recognition, which is capable of higher forms of consciousness including self-awareness and direct knowledge of God; and kardia, the heart (including the inmost heart), which is the seat of conscience, unconditional love, empathy, and unity with God. Praxis also holds that each person has the potential to develop themselves spiritually, initially through self-knowledge and eventually leading to self-mastery. This involves harmonizing and integrating our psychological-physical attributes with our higher faculties, a process that requires grace and our own effort. This process is described as bringing the nous into the kardia (or in more familiar terms, the mind into the heart) to make oneself receptive to communion with the divine. Again, we must purify our lower nature for this communion to be possible. In a modern description of this process, Boris Mouravieff says that we must master the ‘little ‘I’s,’ the constantly changing parts of our personality, each of which normally engages our thoughts, feelings, and sensory-physical functions to satisfy its own needs and interests. We must instead put the intellect, emotions, and body in the service of the ‘Real I’, the stable point of self-awareness within us. The Real I alone is capable of objectively perceiving the changing ‘little ‘I’s’ and directing the psychological-physical functions toward the achievement of a higher aim. This inversion of authority requires both inner-spiritual efforts and conscious action in the outside world. We find these efforts and action described in the Gospel as ‘seeking first the kingdom of God’, 'loving thy neighbor as thyself', ‘turning the other cheek,’ etc. Emotional: recognition and moderation of ‘negative emotions’ and other energy waste; conscious consideration of others; prayer, especially the Jesus Prayer, or Prayer of the Heart; connecting with others making similar efforts; remembering experiences of higher states. Physical: self-control; perceiving and refining posture; developing motor skills and craftsmanship for example in visual arts, music, theatre, or dance; forming habits that sustain attentiveness; bearing difficulty. While these teachings are deeply rooted in Christianity, the truths they represent are universal and can be found at the core of all wisdom traditions. Therefore, readers of Praxis material will find reference to, or hear echoes from Eastern practices of Zen, Sufism, and Yoga, as well as Greek philosophy and Judaism. Praxis teachings are also closely allied with the more contemporary spiritual teachings called ‘The Fourth Way.’ As defined in the 20th century by G.I. Gurdjieff, P.D. 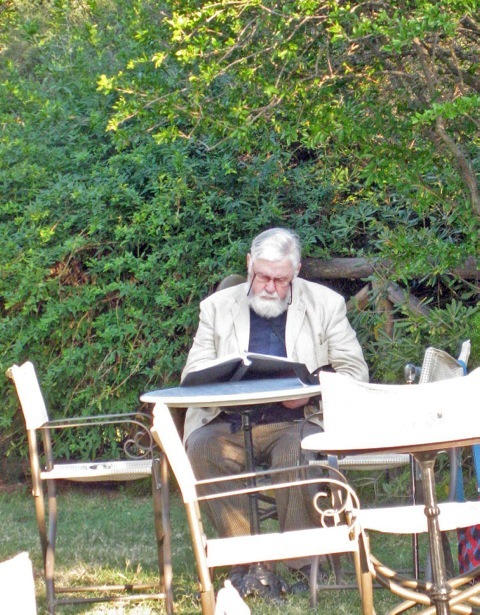 Ouspensky, and later, Boris Mouravieff, the Fourth Way brings teachings and practices from monastic traditions to people living in the world today. Further, while the classic paths or ‘ways’ focus spiritual development primarily in one domain, either physical (e.g., through asceticism or martial arts), emotional (e.g., through prayer or artistic pursuits), or intellectual (e.g., systems like Kabbala or the Yoga Sutras), Fourth Way teachings encompass all three facets of the human being fostering a more holistic and harmonious development. Praxis Research Institute was founded to bring to the West forgotten spiritual teachings from the inner core of Christianity since its earliest beginnings. These teachings still exist in certain monasteries in places like Mount Athos in Greece, where Praxis founder Robin Amis rediscovered them through more than 60 pilgrimages occurring over nearly half a century. 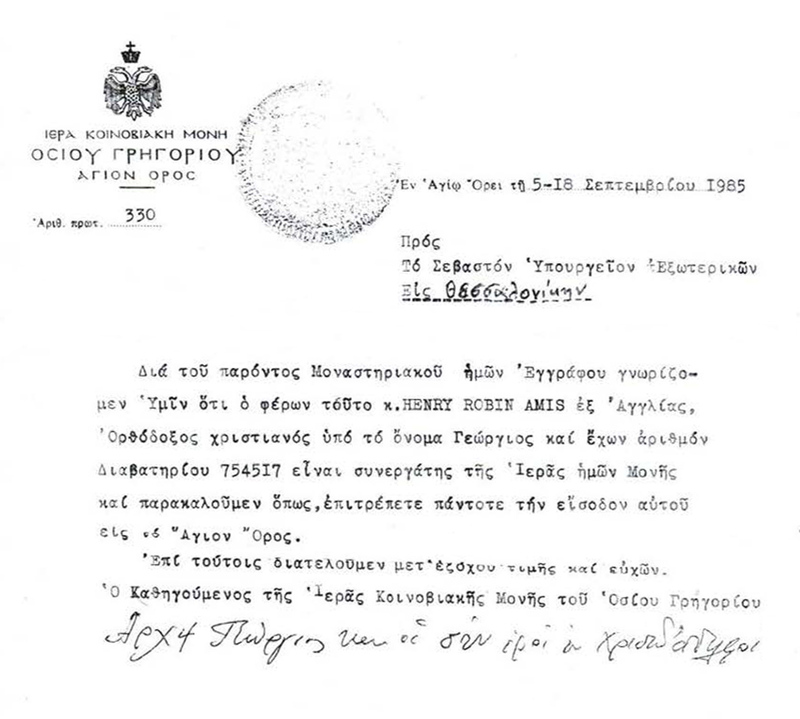 For his research into the teachings of the Holy Mountain, Mr. Amis received the rare designation of Synergatis’ (fellow worker, and equal to the monks), and was given a document providing “free access, both coming in and going out of the Holy Mountain." This document was still valid forty years later until Mr. Amis' passing in 2014. 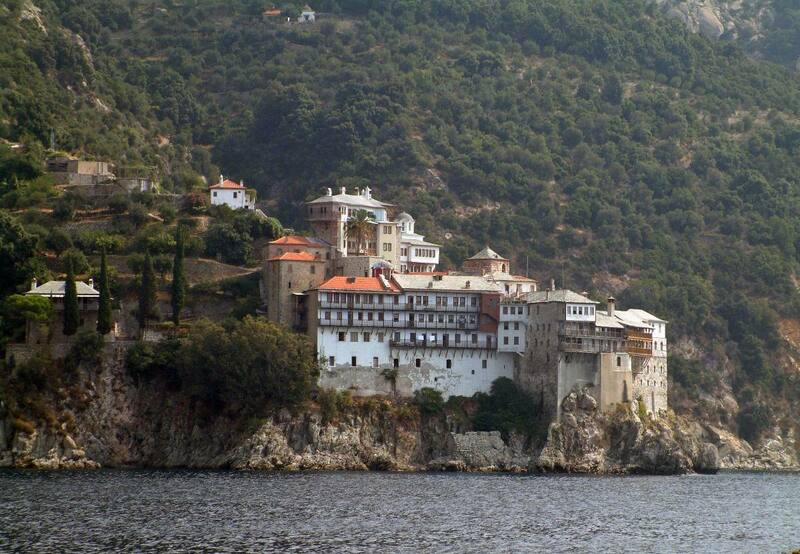 This picture, as seen from the sea, shows the monastery of Osiou Gregoriou, on the West-coast of Mount Athos - one of our main sources for recovering forgotten knowledge. 'You English have served Western man very well with your intellect, giving him many things he needs, the solutions of many problems that have made life easier for everyone. The work of Praxis Research Institute is to make this truth available in as fully practical a form as possible to non-monastics in the Judeo-Christian world.